This committee extends a warm welcome to all new parishioners with a visit and sharing of a packet of church and Chamber of Commerce brochures. When available, the new parishioner receives our current pictorial directory. The primary responsibility of this committee is to make the new parishioners feel important and make them feel welcomed. This group of senior citizens (55+) in the parish meets on the third Wednesday (except in November, it is the last Wednesday of the month) at noon to share a meal and fun. It is a way for seniors to get better acquainted with each other. The group eats at a local restaurant during the winter months and out of town restaurants in the summer months. There are no dues, just a fun time! 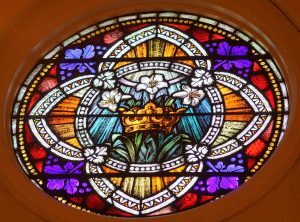 The Daughters of Isabella is a local, national and international organization of Catholic Women dedicated to our motto of Unity, Friendship, and Charity. Monthly meetings are held on the fourth Monday of each month. Annual fundraisers provide a local scholarship and donations are made to many local and other causes. New members are always welcomed. The Knights of Columbus, K of C, is a group of men actively involved in many spiritual, social, charitable and community programs. Lenten Fish Frys, Casino Nights, Italian Night, and Chicken dinners are some of the fundraisers the K of C sponsors during the year. Proceeds help St. Gabriel School, the parish, and the community. The Hall is located at 921 Central Avenue and is open at various times for social and dining events. Council meetings are the first and third Mondays of each month. Time required: As much or as little as one wants. The Knights of Columbus Auxiliary consists of spouses, mothers, daughters etc. of members of the K of C. This, like the K of C, is a spiritual, social and charitable organization. This auxiliary assists the K of C, provides scholarships and makes a basket for the Fall Festival. They meet on the second Tuesday of every month. The Fourth Degree is a group of men within the K of C that have received this highest honor. This is a patriotic degree. Third degree members within the K of C who are members at least one year are eligible. 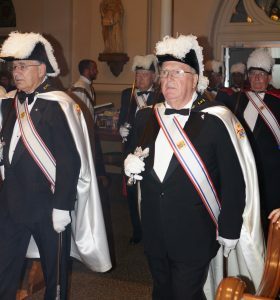 Fourth Degree men serve willingly in full dress at liturgical celebrations, parades, and funerals as Honor Guard.